WorldStage marked its tenth year supporting the annual Cisco Partner Summit by providing its AV expertise and equipment to the general sessions of the 2014 conference in the Venetian Hotel ballroom in Las Vegas. WorldStage screens used for opener, Android JonesHired by InVision Communications, WorldStage executed a complex design for the summit, which was staged for Cisco’s channel network. The ballroom was dominated by a ribbon of six projection screens, all of them angled in a forced perspective set design. They provided a 9322x1254 pixel map for speaker support, demos and entertainment by the Magnetic Poets, Android Jones, Mason Bates and the Las Vegas Youth Orchestra. Two of the screens doubled as scrims so performers behind the screens could be lit and seen clearly by the audience. Three other screens were muslin, and the center screen utilized a zero-gain Da-Lite fabric. WorldStage also furnished a compliment of Christie S+ 16K and HD 20K projectors, a 14-channel Pandora graphics/playback engine to feed three screens directly and a Vista Systems Spyder 3 Series image processor to feed the other three screens, including the widescreen. 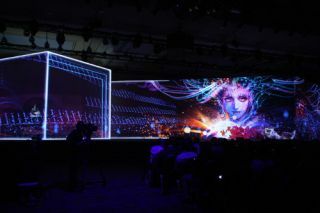 Projection mapping was performed within Pandora for a fluid and borderless screen look. “Last year, the summit was in a very large convention space with 60-foot ceilings,” says WorldStage account executive Richard Bevan. “This year they were in a ballroom where the rigging points were more limited. Getting the right spot and making sure the projection cones were clear of the stage areas took a lot of coordination.” The rapid install was achieved in a remarkable 18 hours – load in, rigging, cabling, screen building. WorldStage also provided a distributed audio system suitable for screens that reached almost to the ceiling, productions comms, and mics and monitors for entertainment support. The audio team juggled over 90 audio sources while managing the wireless frequency coordination in a venue shared by four other meetings and numerous simultaneous breakouts. At InVision Communications Rick Voigt was executive producer, John O’Brien main tent producer, Aaron Hiester producer for the Americas portion, Tony Castrignio designer and Danny Champ technical director. Obscura Digital was the content creator for the multi screen images and videos.